Today I took on the challenge of remembering something from my school days. High school was easy — although it has been almost 12 years since I graduated. Junior high is a blur I don’t want to call up into memory. But as I thought about elementary school I realized I was having some trouble. I’ve always prided myself on my ability to recall the past. I can still remember all of my teachers’ names throughout elementary school, but the details of those years are beginning to fade. 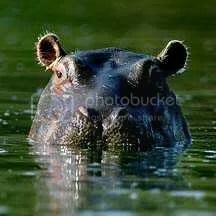 As I thought about 2nd grade, the main thing I could recall was my report on hippopotamuses — or should it be hippopotami? Either way, the interesting fact I gained from my research was that hippos’ sweat is pink…and they wiggle their ears when they’re angry. Actually, that last fact might be from the trip to Disneyland my family took that same year — never let it be said that the Jungle Cruise is not educational. My teacher, Mrs. Noe, worked so hard to teach us that year. She taught us how to make butter by shaking cream in a baby food jar. She also dropped a pumpkin on my head – but that’s a different story. She brought in a TV so we could watch the rescue of Baby Jessica from a well. Despite all of her hard work, my golden nugget from 2nd grade is: “Hippo sweat is pink.” Whenever the topic of hippos comes up – which is more than you’d imagine – my factoid is pulled out from my 2nd grade filing cabinet and displayed for everyone’s benefit. Thank you, Mrs. Noe for giving me the tools to bring wisdom to others. Hippo sweat is pink, eh? I’ve learned something new today! See! It’s very useful knowledge. :) Thanks for providing the link up. Haha! I’m gonna have to go look up a couple of those. Maybe my teacher wasn’t so great either…or maybe i’m just getting old. :) Thanks for stopping by. Melissa, I had no idea about the sweating hippos. Isn’t it interesting the little tidbits of information that we remember? I enjoyed reading this. Now I’m having flashbacks of my own school days.